2017-2018 Knapp Fellows Gayatri Malhotra & Chloe King presenting their research at the 2017 Nashman Symposium of Community Engaged Scholarship. 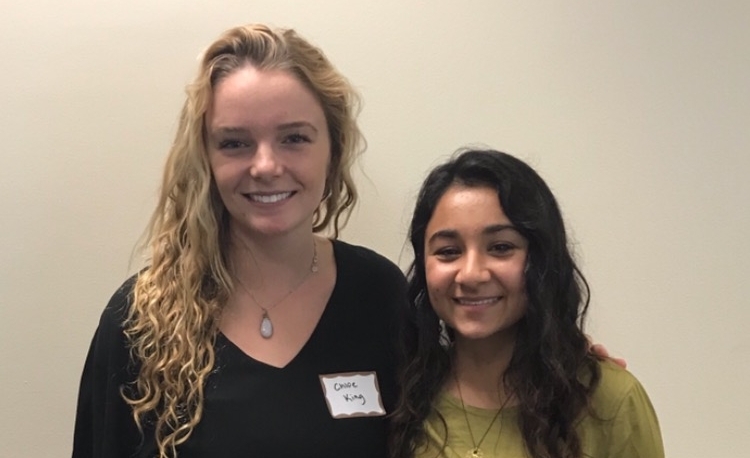 Gayatri is working on gender sensitization in Indian schools & Chloe is working on food waste and environmental impact in DC Public Schools. The 2016-2017 fellowship cycle was awarded to : Maranda C. Ward, a doctoral candidate at the Graduate School of Education and Human Development, who won for her project, “D.C. Youth Expression: Art, Community and Identity,” and School of Media and Public Affairs master’s student Zinhle Essamuah for “The Minority Vote” a film documentary following youth voters as the go to the polls in the primary elections. The 2015-2016 fellowship cycle was awarded to : Mariam Adil, a Masters student in the Elliot School of International Affairs ’16, who is developing video games as learning tools for international development projects called “Stereo-Wipe” and Samantha Cook , a undergraduate in the Elliot School of International Affairs ’16, who won for her project “Digital Hope” a digital and marketing communications curriculum to help teach digital literacy skills to homeless populations so that they can have access to micro-work environments. The 2014-2015 fellowship cycle was awarded to one project: Pop Art -Painting Out Poverty’s mission is to unite artists in a fight against poverty in DC neighborhoods. Through sharing our painting, music, poetry, and other arts, we hope to collectively end disparities in the community . This team is being lead by Paulina Sosa a graduate student in the Milken Institute of Public Health ’16 and was announced on June 1, 2014. The 2013-2014 fellowship cycle was awarded to two projects: Ascension GW a yogatherapy program to assist victims of sexual assault led by Emily Rasowsky , Ivonne G Ramirez, and Aly Azharand Mobile Medical Care a mobile primary care van that travel to wards that had limited to access to primary care facilities led by Ben Trevais, Mary Kaldas, and Tri Hiremath . These fellows were announced on April 27, 2013, at the Spring Service-Learning Symposium. The 2012-2013 fellowship cycle was awarded to two projects: the Financial Literacy Program coordinated by Sofi Momen and Amir Abdallah and Waste Diversion DC by Manmeet Sandhu and Reshma Arrington. The fellows were announced on May 1st 2012, at the Spring Service-Learning Symposium. The Knapp Fellowship for Entrepreneurial Service Learning was launched in 2011. The first fellow was Melissa Eddison, then a junior who launched a sustainability project with the goal of creating a gw co-op cafe.